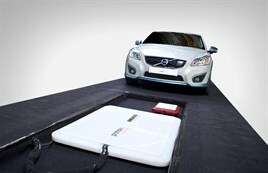 Volvo has taken part in a wireless electric vehicle charging research project which can fully charge its Volvo C30 Electric in 2.5 hours. The project took place in Belgium and Volvo was part of a consortium of companies testing the technology, providing C30 EVs for testing. Lennart Stegland, vice president, Electric Propulsion System at Volvo Car Group, said: “Inductive charging has great potential. Cordless technology is a comfortable and effective way to conveniently transfer energy. The study also indicates that it is safe. Volvo has already launched its V60 plug-in hybrid which is on sale in the UK now and is researching charging technology to support the launch of more EVs. Volvo has initiated a strategic co-operation with Siemens in order to develop electrical drive technology, power electronics and charging technology as well as the integration of these systems into electric vehicles.